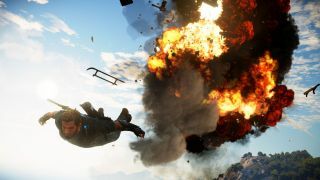 Above, courtesy of IGN, you can watch Avalanche studio head Roland Lesterlin demonstrate the challenge modes of Just Cause 3. There are two types shown in the video; one in which Rico flies his new wingsuit through a series of rings, and another in which Rico flies his rockets through a variety of explodable items. This was the demo I got to try at Gamescom. I can confirm that this will be a game with some really beautiful explosions. Things explode at slightly different times and in slightly different ways, and so a good chain reaction results in a staggered cacophony of carnage. It's very pretty. Alas, the open world itself wasn't on show. Samuel got to play it earlier in the year, though, and you can read his impressions here. Just Cause 3 is out on December 1.